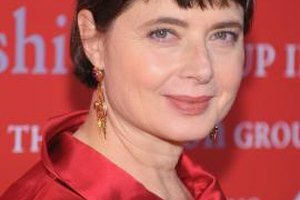 Isabella Rossellini sports a smooth complexion at the Fashion Group International's 28th Annual Night of Stars in New York City. Mature skin requires different treatment than younger skin but that doesn't mean you can't achieve a beautiful finish. Rather than relying on the makeup you chose when you were 20-something, consider the tips and tricks that will best illuminate your features instead of your wrinkles. From the type of foundation you choose to the way you apply it to your skin, these little details can mean the difference between a not-so-great finish or the appearance of a super-smooth, youthful complexion. Select a "second-skin" cream foundation, which means a sheer formulation that is meant to let your skin peek through. Heavy foundations magnify wrinkles. Look for an oil-based foundation if you have skin that doesn't tend to break out or reach for a water-in-silicone formulation if you still see a pimple or two. Rub a gentle exfoliating face wash between your hands and add water. Gently apply this to your face in small circular motions to remove any dead skin cells which can result in flaking and a not-so-smooth appearance. Apply your daily moisturizer to your face for hydration -- if you don't have one, choose a moisturizer formulated for mature skin and your particular skin type, whether dry, normal or oily. Dry skin will need extra hydration while oily skin may require moisture plus mattifying properties. Squeeze a dime-size drop of makeup primer into the palm of your hand. Dot the primer on your forehead, cheeks, nose and chin and spread evenly to help fill in lines so your foundation doesn't sink into them. Squirt or pour a pea-sized amount of foundation onto the back of your hand and pick a bit up on a foundation makeup brush. Sweep the brush over your nose in small circular motions, working your way out toward the outer margins of your face, focusing on covering up discoloration for beautiful coverage with a smooth finish. If age has been particularly drying on your skin, reach for a moisturizing foundation with a super creamy texture to help camouflage wrinkles. Speak with a cosmetics sales associate or makeup artist if you need help choosing your perfect shade -- a too-pale foundation can make skin look more mature than it is. Look for products with peptides and other anti-aging agents to assist with the appearance of more youthful skin. If you need to powder your nose, do just that and little more -- applying powder to oily areas of skin is fine, but if you swipe it over wrinkles, the powder will settle in the lines, making them more pronounced. What Makeup Should I Wear With a Ruddy Complexion? Do You Use Foundation or Concealer to Cover Up Pimples?